When Uma Thurman looks at John Travolta rolling his own cigarette in "Pulp Fiction" and says, so, so, so eloquently, "Will you roll me one of those, cowboy?" When Lauren Bacall makes her entrance in "To Have and Have Not" and says as only the young Lauren Bacall ever could "Anybody got a match?" 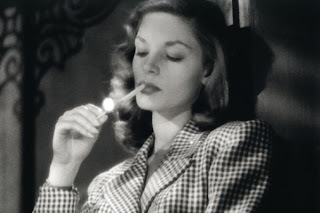 and then Humphrey Bogart tosses her a pack of matches and she lights her cigarette and tosses away the used match with the utmost grace and tosses the pack of matches back to Humphrey Bogart and says "Thanks" and then leaves. When Karen Allen, with a smoldering cigarette in one hand, declares "Listen, Herr Mack, I don't know what kind of people you're used to dealing with but nobody tells me what to do in my place" in "Raiders of the Lost Ark". When Bill Murray has two cigarettes going at the same time in the hospital elevator in "Rushmore". When Faye Dunaway has two cigarettes going at the same in "Chinatown" leading Jack Nicholson to dryly comment "You've already got one going, Mrs. Mulwray." When Sienna Miller smokes a...(Reader: "Not the Sienna Miller smokes a cigarette while pouring a glass of scotch in 'Interview' thing! My God, you mention that every other post! Haven't we suffered enough?" Me: "Sorry, Sparky, my blog, my rules. ")...As I was saying, when Sienna Miller smokes a cigarette while simultaneously pouring a glass of scotch in "Interview". When Kate Winslet takes a drag of Leonardo DiCaprio's cigarette without asking in the moment before she stands up on her drunken tip-toes in "Titanic" ("let's see you do this"). When John Cusack sits behind the counter at his record store with a cigarette burning in one hand with the purest expression of rage, bitterness and grief on his face and the female customer comes up to him and asks "Do you have soul?" in "High Fidelity". Boy, thinking about all this makes me want a cigarette. Oh, right, except it doesn't since I don't and never have smoked. Huh. Go figure. This just in: G.I. Joe's Sienna Miller has unexpectedly died of lung cancer, a year shy of when doctors had originally informed her that she would die from cirrhosis of the liver. Even with emphysema Sienna Miller would still be the prettiest girl at the dance.